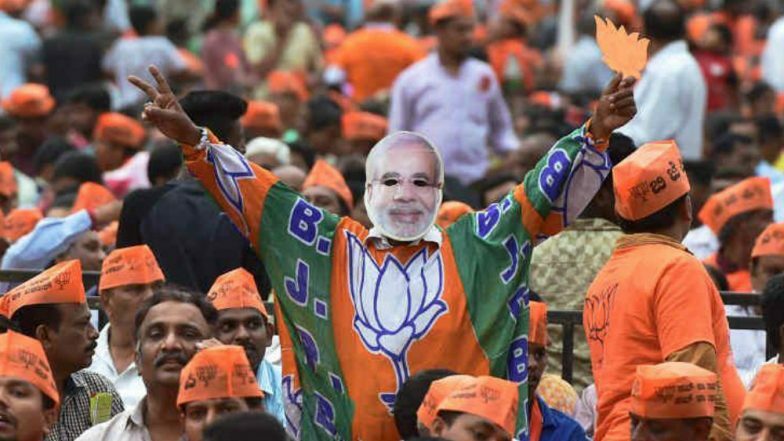 New Delhi, March 22: The Bharatiya Janata Party (BJP) is predicted to win 246-249 seats, whereas the Congress party may bag 76-78 seats in the upcoming Lok Sabha elections, according to bookies in Madhya Pradesh's Satta Bazar. Of the 29 Lok Sabha seats in Madhya Pradesh, the BJP is likely to win 21 seats, predicted those who play Matka. Both the BJP and the Congress, however, are confident of winning more seats in Lok Sabha polls. "If someone bets on BJP and the party gets less than 246, it will fetch double the amount placed as bet. But if BJP gets 246 seats or more, the bettor gets," TOI quoted sources as saying. Earlier, Rajasthan's famous Satta Bazar made similar predictions about the Lok Sabha elections results. According to bookies in Jaipur, the BJP will get over 250 seats, with National Democratic Alliance (NDA) winning 300-310 seats in the 2019 Lok Sabha polls. Congress is projected to win 72-74 seats, suggested Matka trends in Phalodi near Jodhpur. Bookies involve in Matka game said that BJP's chances have brightened after air strikes in Pakistan's Balakot as Prime Minister Narendra Modi has emerged stronger since then. Consequently, the Satta Bazar lowered the number of seats for Congress to 72-74 from 100 predicted earlier. The State of the Nation opinion poll conducted by CVoter on March 10 had predicted that the BJP-led NDA will fall marginally short of a majority in the Lok Sabha but will comfortably form the government with post-poll tie-ups. In terms of seats, the BJP is expected to get 220 seats on its own and the allies are likely to get 44. In the UPA camp, the Congress is expected to get 86 and other partners will add up another 55. The opinion poll projected that the NDA will get 264 seats while the Congress-led United Progressive Alliance (UPA) is expected to reach a tally of 141 and all other parties are expected to get 138 seats. Lok Sabha elections will begin on April 11 and will be held over seven phases followed by counting of votes on May 23.